An aerial view of Tamar’s Basingstoke plant which has capacity to process up to 40,000 tonnes of food waste per annum. Copyright Biogen. 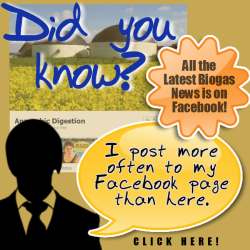 Biogen has announced (7 February 2018) that it has bought Tamar Energy, and with the acquisition of the Millerhill anaerobic digestion facility (Scotland) only recently, in January 2018, is now one of the largest of the UK’s food waste biogas plant owner-operators in the UK . Tamar Energy was itself already one of the leading anaerobic digestion (AD) plant owners and operators in the UK. Tamar Energy like, Biogen has been a trail-blazing company, and an early participant in developing the commercial food waste digestion industry in the UK. The acquisition for both purchases was completed by Ancala Partners LLP, which is described as an independent mid-market infrastructure investment manager. 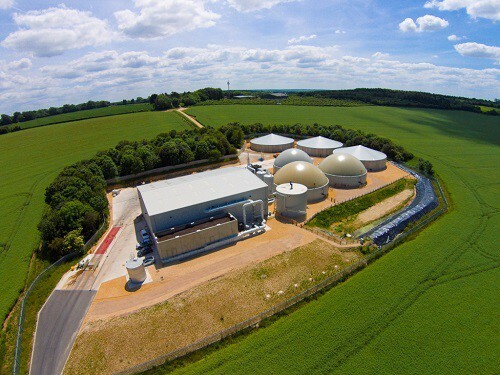 “The acquisition of Tamar Energy represents a significant opportunity to create a best-in-class anaerobic digestion business. With the support of Ancala, I look forward to a future of continued growth and investment in the Biogen platform. I firmly believe that this acquisition will provide all customers and stakeholders with an enhanced service.” Visit the Biogen Website here. Combining the two groups would appear to make good strategic sense for both companies, which appears to come with added with benefits in further investment. With food waste collection tonnages rising more slowly than many had predicted, food waste AD processors across all England, have been experiencing lower food waste availability and this has created lean times. There has been a lack of central government direction for pushing forward food-waste collection targets since the Conservatives returned to power in 2010. The percentage of overall recycling achieved in England has hardly risen since 2015, meaning that the government’s own declared recycling targets for 2020 now look increasingly likely not to be met. The continuing restrictions on local authority budgets to enable new food waste collection scheme to be introduced have not helped. And, a lack of positive food waste recycling initiatives in England, have probably made it inevitable that take-over and mergers of this type would occur. The young food waste AD industry has not had the support anywhere near to the extent seen in Wales, and Scotland In England, gate fees have been dropping, with many talking of some food waste AD operators now accepting food waste at low, or zero, gate fees. Biogen, a portfolio company of infrastructure investment manager Ancala Partners LLP, has acquired food waste treatment firm, Tamar Energy, for an undisclosed sum. Second acquisition made by Ancala’s anaerobic digestion portfolio company, Biogen – London, 6 February 2018 – Biogen, a portfolio company of Ancala Partners LLP (‘Ancala’), the independent mid-market infrastructure investment manager, has acquired Tamar Energy, one of the largest anaerobic digestion (“AD”) owners and operators in the UK, for an undisclosed sum. Today, the Tamar Energy website held no enlightenment on the deal from their point of view, with their latest news apparently, their achievement of earning key industry certification and quality stadards across all of its UK anaerobic digestion (AD) network. This is a wicked shame. Good companies cannot survive. nothing but take-overs. This country makes you weep. But, maybe composting is better because it must be cheaper? interesting news we have a Tamar plant near us.